ESP8266-01 is a very low cost WiFi enabled chip. But it has very limited I/O. At first glance, once you configure it for programming all the pins are used. This page builds on Using ESP8266 GPIO0/GPIO2/GPIO15 pins to show you how you can get four (4) usable inputs/outputs for you next ESP8266-01 project and how to use IC2 to get even more inputs. The ESP8266-01 is the smallest ESP8266 module and only has 8 pins. Of these VCC, GND, RST (reset) and CH_PD (chip select) are not I/O pins but are needed the operation of the module. This leaves GPIO0, GPIO2, TX and RX available as possible I/O pins, but even these have pre-assigned functions. The GPIO0 and GPIO2 determine what mode the module starts up in and the TX/RX pins are used to program the module and for Serial I/O, commonly used for debugging. GPIO0 and GPIO2 need to have pull-up resistors connected to ensure the module starts up correctly. 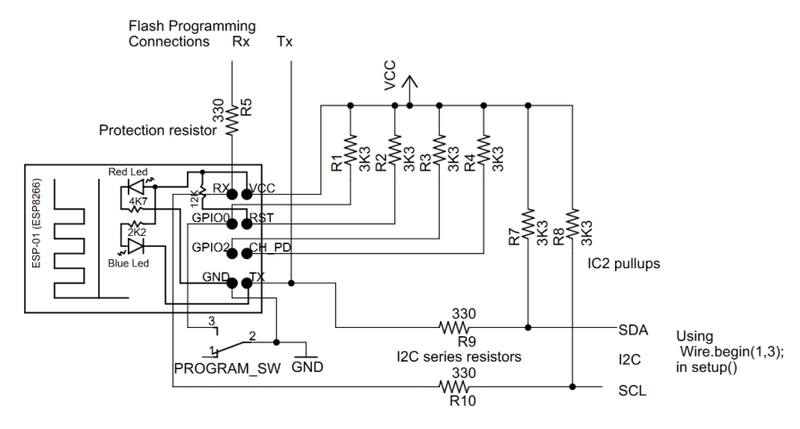 The best trick to get extra inputs into the ESP8266-01 is to use an I2C interface. One choice is to use GPIO0 and GPIO2 as the I2C bus. The pullup resistors needed to get the module to start up correctly can double as the I2C bus pull-up resistors and the other, slave, components on the bus are open collector and so should not pull the bus down on power-up. However in some cases slaves, particularly those with battery backup, can become stuck and hold the bus down. In those cases you will need to isolate the bus until the ESP8266 gets through its boot stage. When programming the ESP8266, the RX line is connected to the programmer's output. At the end of the programming the ESP8266 reboots and 330 Protection resistor prevents RX shorting the programmer's output drive. The ESP8266 is 3.3V device so preferably use 3.3V I2C slaves. Many, but not all, I2C devices are are 3.3V these days. “In general, in a system where one device is at a higher voltage than another, it may be possible to connect the two devices via I2C without any level shifting circuitry in between them. The trick is to connect the pull-up resistors to the lower of the two voltages.” (SparkFun I2C tutorial) For a mixture of 5V and 3.3V devices connect the pullup resistors to the 3.3V line, as shown above. Using I2C is a great way to add a multi-channel A-to-D converter to the ESP8266-01 which does not expose the single ADC input of the underlying module. For example using Adafruit 12bit I2C 4 channel ADC or for analog output SparkFun's I2C DAC Breakout – MCP4725 board. Many other types of sensors are also available with I2C buses. While can send debug messages over the WiFi connection it is often convenient to use the TX connection. The next example show how to use GPIO0 and GPIO2 as outputs and RX as an input. allows you to use RX as a general purpose input (or another output), while still writing debug messages to Serial. Again the 330 ohm resistor in the RX lead to the Flash programmer protects against shorting out the programmer's driver. NOTE: S1 will have to be open in order to program the ESP8266. Here is another way of configuring the pins. Note: This trick only works if you have a relay module with an isolated input (N1 and N1-com). Because of this limitation and the complexity of the supporting code, the previous example, using RX as an input, is preferable. Using ESP8266 GPIO0/GPIO2/GPIO15 pins has already covered how to use GPIO0/GPIO2 together to get an extra input. Here that example will be extended to use GPIO0 as an relay driver output and GPIO0/GPIO2 as an input without using RX or TX. Here is the schematic as a pdf. Here GPIO0 is used as an output to drive the relay and GPIO0/GPIO2 is used as an input to read the momentary push button which is used as a manual override to turn the relay on and off, in addition to the remote control over the WiFi connection. The momentary push button is also used to enable the config mode if it is press when power is applied. The trick here is to do all this while still keeping GPIO0 and GPIO2 high when the ESP8266 module is initializing. The pull-up resistors, R1 and R3, provide the necessary High for these two pins, but you have to ensure that any extra circuitry attached to GPIO0 and GPIO2 cannot not pull pins low. 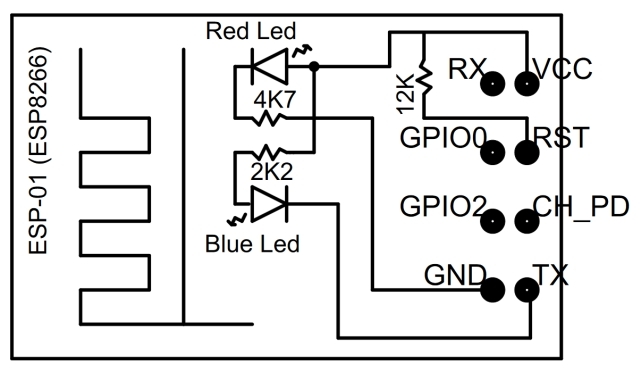 The optically isolated relay is connected between +3.3V and GPIO0. This keeps GPIO0 high on start up but allows GPIO0 to be made an output, after startup, and ground the relay input to operate the relay. It does not matter if the momentary push button is operated while the module is initializing, as that just connects GPIO0 to GPIO2 and connect both of these to their pullup resistors. Using the ESP8266 as a temporary access point you can configure it via a web page as described here. Part of that process is to use a push button, or shorting link, on power-up to indicate to the software that you want to enter config mode. Once the ESP8266 module has initialized, it runs the setup() code. In that code, to detect if the momentary push button is pressed, you need not make GPIO0 low to supply a GND to push button and then check the GPIO2 input to see if it low. A side affect of this check is that the relay will always be operated when the unit is being put into config mode. Once you see the relay operate you can can release the push button, because its input will have been detected by then. The previous section covered detecting when the push button was pressed on power up to enable config mode. We also want to use that push button as a manual override for turning the relay on and off in addition to being able to control the relay via the WiFi link. The WiFi control of the relay is not covered here, but can easily be done using pfodApp. See OLIMEX Menu Generator for how to generate Arduino code with pfodDesigner for ESP8266 modules. This section will deal with how to detect when the push button is pushed, indicating the user wants to toggle the relay, i.e. turn it OFF is it on or turn it ON if it is off. ii) The relay is ON and the user wants to turn it off using the push button. The relay is OFF and the user wants to turn it on using the push button. In this case the output of GPIO0 is HIGH. Actually GPIO0 can be an input in this case as the pull up resistor R1 will ensure the relay does not turn on. That is the trick. In this case make GPIO0 an Input and make GPIO2 Output LOW and then when the user presses the push button, two things will happen:- a) the relay will turn on due to the ground provided by GPIO2 via the push button and b) the Input GPIO0 will go low. The code checks the state of the Input GPIO0 and when it goes LOW the code knows the use has pressed the push button and wants the relay to be on. The code then makes GPIO0 an Output LOW to keep the relay on when the push button is released. The relay is ON and the user wants to turn it off using the push button. In this case, following on from the case above, GPIO0 is an Output LOW holding the relay ON. Now for this case make GPIO2 an Input (pulled up by R3) and then when the user presses the push button the Input GPIO2 is pulled LOW by the LOW Output on GPIO0. When the use releases the push button the code detect the LOW to HIGH transition and then makes GPIO0 an Input, which releases the relay due to the pull up resistor, R1, and makes GPIO2 an Output LOW to set up for case i) above. One more trick. For case ii) we need GPIO2 as an Input which detects a LOW to HIGH transition to turn the relay OFF. But if we make GPIO2 and input at the end of case i) then we will get a LOW to HIGH transition as the user releases the push button they just pressed to turn the relay ON. To avoid turning the relay off again immediately, the first LOW to HIGH transition after turning the relay will be ignored as it is just the user releasing the push button they pressed to turn the relay ON. In this code I am ignoring switch debounce for simplicity. The inputs should be debounced in any real application. 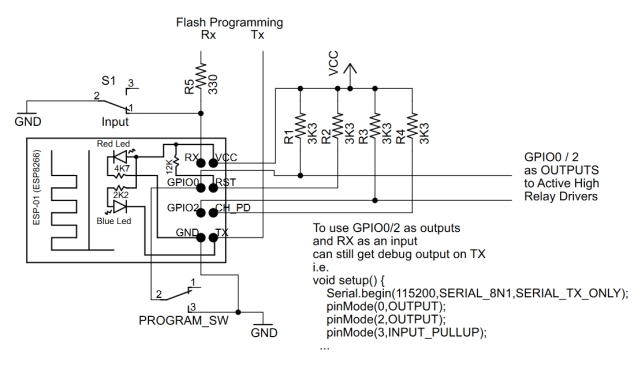 This page shows how to get the most out the limited pins available on the ESP8266-01. Using GPIO0 / GPIO2 as an I2C bus gives the biggest expansion, but if you project does not use I2C, you can still drive a relay and detect a push button input using GPIO0 / GPIO2. In either case TX is still available for Serial debugging or if you send debug print statements over the WiFi link, TX is also available for general I/O as well.